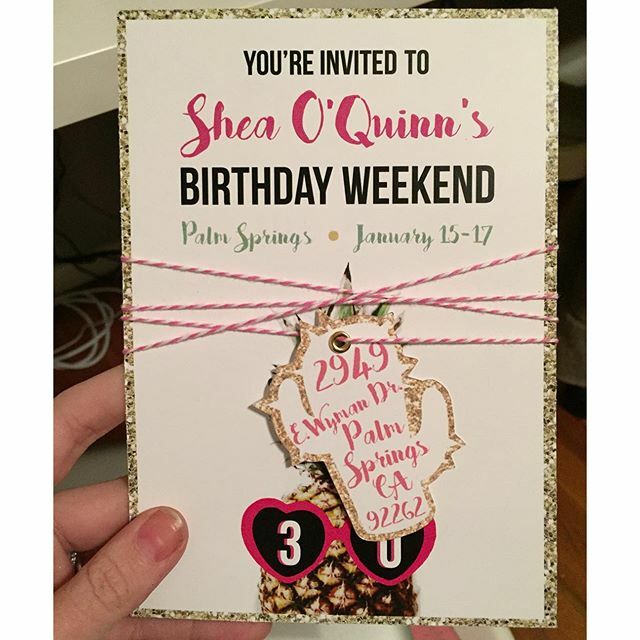 Several months ago now, my girlfriends and I headed out to sunny Palm Springs for my 30th birthday. We had a blast and, although we were there for my birthday, I wanted it to be about my friends too! That is why I curated the perfect collection of goodies for my girls, and put them in an adorable tote bag (designed by me and printed by my good friend Frankie with Go 2 Print Ink). Because you can never have enough tote bags am I right? Plus, it makes boring things like grocery shopping a little more fun when you have an adorable tote to carry your groceries. 1. Pink Flamingo drink float- These are a Palm Springs MUST. They keep your drink afloat while looking oh so adorable. 2. 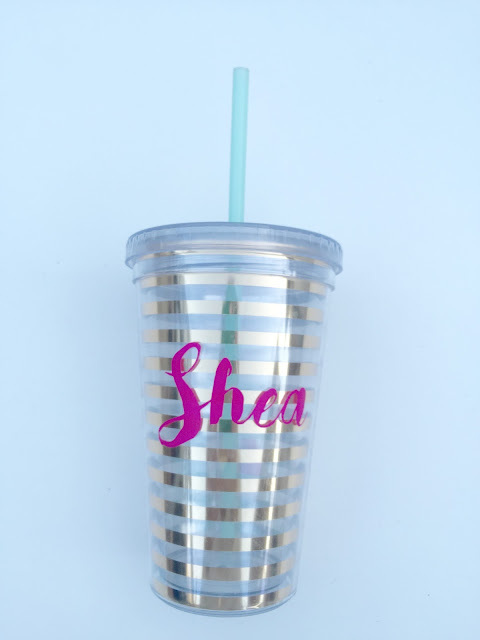 Custom Name Straws- With names like Shea, Danica, Stefana, and Kimiyo, to name a few, it's safe to say most of my friends never find their names on a keychain. So I thought it would be cool to get some custom name straws made (in pink of course). These straws were extremely reasonably priced (especially considering they were totally custom and made to order) AND they arrived SO quick. I will definitely be buying from them again. 3. Mini Perrier Can- I knew that some drinking would be happening and I wanted to give everyone a nice refreshing drink as an option as well. These cans were too cute to pass up and, add a cute paper straw with some bakers twine... perfection. 4. Mini Sofia Champagne Can- A PINK can of champagne?? It as a no-brainer. 5. Gold Flamingo Bottle Opener- You had me at gold flamingo... but then add in that its a functioning bottle opener and I knew I had to buy them. 6. Flamingo Towel (similar)- This wasn't something I had planned on buying (because towels aren't cheap). But Forever21 had them on clearance and they were too good to pass up. 7. Pink Heart Shaped Sunglasses- These little guys gave me a scare. These were the only MUST HAVE item in the bag. The pink heart shaped glasses were kind of the theme of the whole weekend. They were on the invite, they were on the tote, they were on the cake, they were everywhere. BUT... since they were coming from Hong Kong, they almost didn't make it in time! I think they ended up arriving a day or two before we left... THANKFULLY. 8. Custom Name Tags- These were something I whipped up on my Cricut Explore Air. I wanted everyone to know which tote bag was theirs without having to go through each one. Each bag was essentially the same, but with the custom name straws and tumblers it was nice to know whose was whose. 9. Flower Crown Headband (similar)- I'm a big proponent of all things flower crown. I wore one for my bridal shower. I wore one for my wedding. I even had a flower crown making station at my best friends baby shower! So these were obviously a must. 10. Custom Palm Springs Tote- I needed something to put everyone's goodies in! So a tote bag was an easy decision. A less easy decision was, what they were going to look like. After some tweaks and changes, I landed on this design. I sent it over to my friend Frankie at Go 2 Print Ink and he created something that was my EXACT vision. He even surprised me by making the inside of the sunglasses a black glitter. So perfect. When I originally wrote this post, I TOTALLY forgot one of the best things included in the tote! The custom tumblers! The tumblers themselves were a Target dollar spot find (Thank you Bryanna for searching several stores until we had enough). 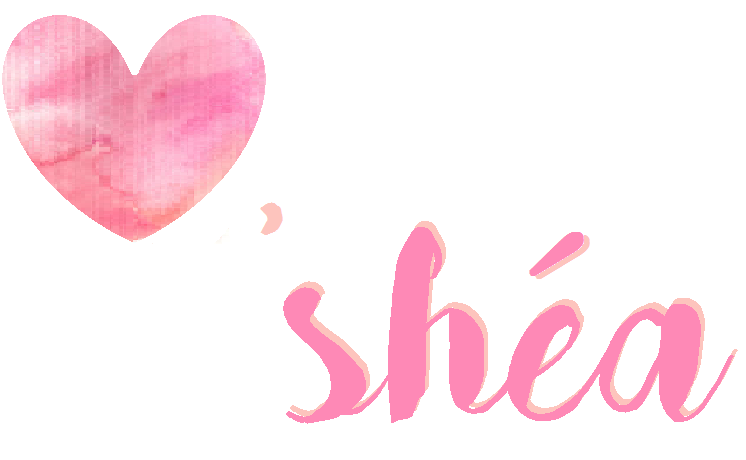 Then, using my Cricut Explore Air I added everyone's names in hot pink (AND in the same font as the invites and totes of course). These were a hit and the reason I forgot to include it originally is because I've been using it ever since! And that's it! 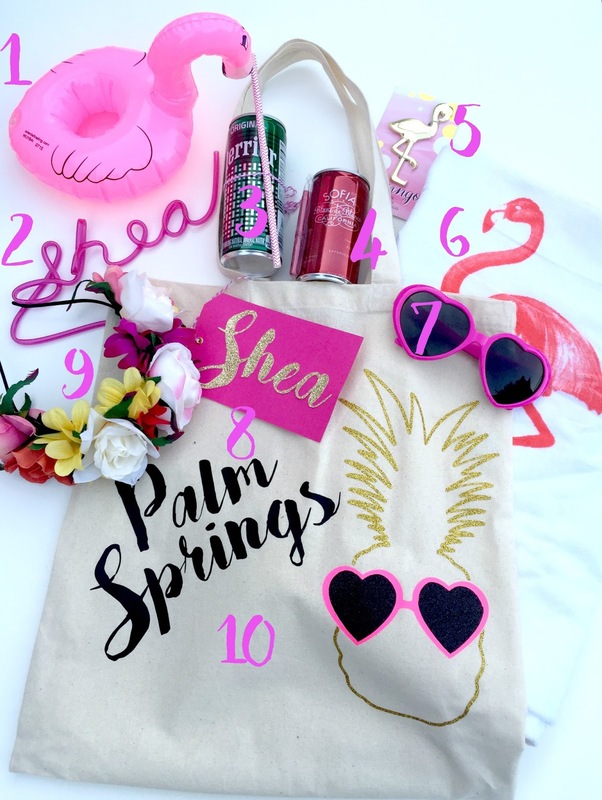 Everything that was in my "Shea's Palm Springs Fling" tote bags! I still love everything that was in them and hope all my girls did too. Now... the question is... what is my next party going to be? ?